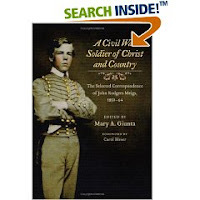 The authors have created a marvelous study of the 90,000 soldiers who saw combat on April 6th and 7th, 1862 in western Tennessee, a few miles north of Corinth, Mississippi. 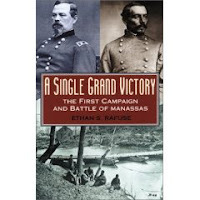 Like First Manassas, Shiloh taught the citizens of the Union and Confederacy something unexpected. First Masassas taught that the war would not end in 90 days. Shiloh taught that the war would be extremely bloody. With 23,000 in two days fighting, Shiloh ranks with Antietam as one of the costliest battles in the briefest amount of time. Studies of heroic romanticism, training and leadership, and combat morale are briefly discussed and the literature in the field is outlined succinctly. The method of reseach is described and impresses the reader. 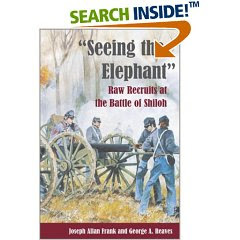 The authors used 450 diaries and letter collections from 160 regiments and batteries that had not seen combat until Shiloh. Of the 450 soldiers' papers, Reaves and Frank retained 381 soldiers' works that contained enough information to be placed in a data set. Of course, the material was inchoate, spread among letters, diaries and reminiences. The authors approached this material with 76 questions. If answers to 10 of these questions were found in the soldiers' material, then the source documents were admitted to the data set. The vast majority of the material in the data set was created during the first year of the war. At the very beginning, the authors set aside "one-dimensional approaches emphasizing, for example, a Victorian heroic ethos or a single factors such as comradship." Reaves, a National Park Ranger serving at Shiloh National Battlefield Park, and Frank, a academic historian, offer an exemplary work of history. 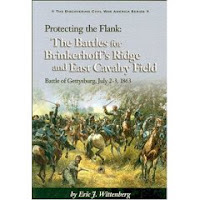 Protecting the Flank: The Battles for Brinkerhoff's Ridge and East Cavalry Field, Wittenberg, Eric J., 201 pp., softcover, index, bibliography, endnotes, appendices, Ironclad Publishing, 2002. 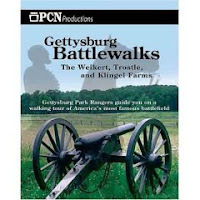 Three and a half miles east from the main Gettsyburg battlefield park is another portion of the park, one that did not contain the huge number of casualites that the main park has. Neverless, the importance of these battles are recognized when the Baltimore Pike is less than three miles away. As many have begun to realize, the eastern portions of the battle: Culp's Hill, East Cemetery Hill, Brinkerhoff's Ridge, and the Rummel Farm may have been more crucial to the outcome of the battle than Pickett's Charge. The fight on Brinkerhoff's Ridge was between a portion of the Stonewall Brigade of Johnson's Division (CSA) and McIntosh's Brigade of Gregg's Divison of Federal cavalry. 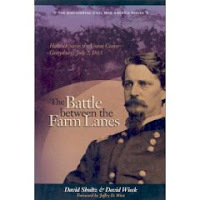 This book furthers the agruement in favor of Ewell's decision to use a portion of his infantry on the evening of July 1st, 2nd, and 3rd to cover his left flank due to the constant rumor that Federal troops were coming up the Hanover Road that runs straight through the cavalry actions of July 3rd. The fight on the Rummel Farm was between three brigades of CSA cavalry and parts of three brigades of Federal cavalry. Chambliss', Lee's, and Hampton's brigades were to be the rope in the snare set for the Federal cavalry. Fortunately for Gregg's division, the commander sniffed a trap, triggered the bait, and then attacked those CSA troops that were advance to capture the Union force. In dramatic fashion, Wittenberg combines descriptions of personalities with strategy, of hand-to-hand combat with tactics, and of heroism with fighting. The author balances the human element and the tactical element on the battlefield. He uses the soldiers words to both advance the story and bring the action to the climax. Wittenberg handles the Custer anecdotes even handedly with the Hampton stories, the Wolverines tales with the Palmetto heroics. The last third of the book is a driving/walking tour of these two cavalry battlefields, illustrated by 20 modern photographs, the majority of which are well composed. There are those several that are covered in shadows and do not give a clear idea of the monument. The maps are informative and clear; the captions under the portaits include unit in which the officer served. The appendices are the Federal and Confederate order of battle of those units that served on the field that day. This book is a welcomed addition to the body of literature on the Battle of Gettysburg. Well written and easy to use as a guide, this book is both informative and entertaining. 301 pages, paperbound, endnotes, bibliography, index, Ironclad Press, 2006. 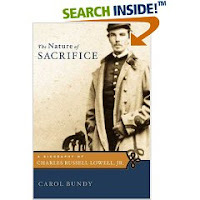 Paying close attention to the physical terrain of the battlefield, Schultz and Wieck offer an important re-visitation to familar material regarding the 'close run thing' of the Union center between 5:00 and 7:00pm on July 2nd 1863. A great amount of detail is offered and succesfully puts into context the charge of the 1st Minnesota, which in popular treatments of the battle, is second only to the 20th Maine's heroics on Little Round Top. The authors make clear that the glory the 1st Minnesota gained during the charge was with the aid of the 111th New York infantry, commanded by Colonel Clinton MacDougall and the 4th U.S. Artillery, Battery C, commanded by Lt. Evan Thomas. The flanks of the 1st Minnesota were aided by artillery on the right, and on the left by a infantry charge immediately before the Minnesotans effort. The 111th New York was one of the three regiments that was unfairly lableled as the 'Harper's Ferry Cowards' stemming from an unfortunate command decision during the Sharpsburg Campaign of 1862. The personality and presence of Winfield S. Hancock is a recurring theme in every chapter. He is the single most decisive element in the preservation of the Federal center along Cemetery Ridge. Lacking from the discussion is a description of Hancock's staff, which in this micro-history, would have been enlightening and enjoyable. This reader finished the the book thinking that Hancock was unaccompanied by couriers, advisors, and aides as he rode between the farmslanes during the afternoon of July 2nd. Yet, there are some difficulties with this book. The size of the type font must be 18 point or larger. Initially I thought the publisher had sent me the Large Print edition for the visually impaired. There was a period of adjustment for my eyes to accommodate such large text. Also, some printer/publisher proofreading needed to be done before setting this book between its covers. The pages listed for the maps in the table of contents does not match with the actual page locations of the maps in the book. Also, the maps do not have the farmsteads labled which is a curious thing for a book that has the word 'farmlanes' in its title. Only one map, Tour Stop # 5, has a farm building labled. The maps have on them only the modern park roads and not the 1863 farmlanes. Furthermore, it would have been convienent for the reader if the publisher put a few maps in the first section of the book that describes the 1863 fighting. All the maps are in the second section of the book that describes the modern driving and walking tour. In addition, the portaits of officers do not have their units in the captions. Lacking is a picture of Colonel William J. Colville (1st Minnesota) though it is located in the Library of Congress. At times the writing style doesn't carry the narrative consistenly forward. A favorite expression of the authors is 'by the time . . .' but there is very few statements of time in the book. Of course, given the fact that the book covers about two hours of fighting, the reader does not expect a minute by minute account, but an estimation of the range time, such as the phrase '. . .about 3:30pm . . .' or ' . . . probably sometime between 4:00pm and 4:30pm . . .' would have helped. From the bibliography is missing Richard Moe's highly regarded 'The Last Full Measure: The Life and Death of the First Minnesota Volunteers.' 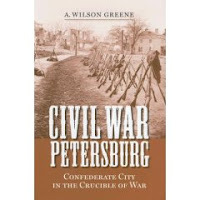 Missing from the book are appendices at the end of the book; especially helpful would have been an Union and Confederate order of battle of those units on the field at the Union center. There is an appendix which offers an essay on measuring the ground on which the fight occurred; the appendix is located in the middle of the book, between the narrative and the tour. Though mechanically the book has its flaws, overall the discussion it offers is enlightening and clearly presented.